Peel and cut the shallot into four pieces, and put into a freezer bag with the oil, mustard, dried sage, a good grinding of pepper, and Worcestershire sauce. Cut lemons in half, squeeze juice into bag, and then cut the halves into eighths and add them. Squeeze everything around to mix, then add the chicken pieces. Leave to marinade in the refrigerator for a few hours (overnight is perfect). 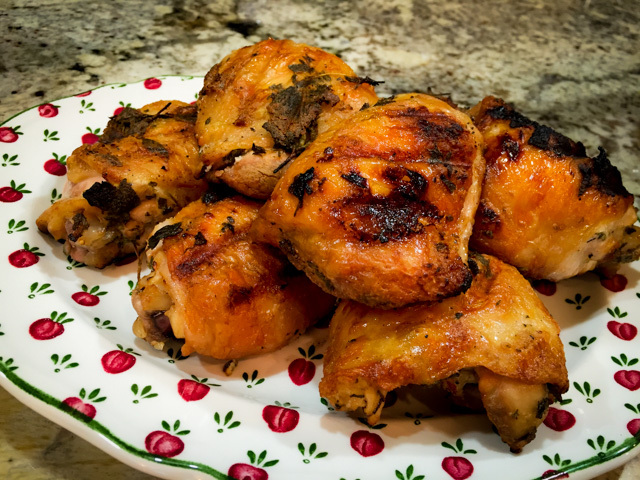 Heat oven to 325 degrees F. Allow the chicken to come to room temperature in its marinade. Arrange the chicken pieces in a roasting tin skin side up with the marinade, including all the bits and pieces, and tuck the sausages around them. Season with salt. Sprinkle the fresh sage leaves over the chicken and sausages and then put the pan into the oven, covered with aluminum foil for to cook for 1 hour. Remove the foil, increase heat to 425 F and keep roasting until the skin turns golden brown and starts to crisp up. Comments: This is such an easy recipe to put together! It is originally from her cookbook Feast, but she featured the recipe in one of her shows back in the good old times of FoodTV Network. I modified it quite a bit not so much in terms of ingredients, but cooking method, because as I’ve mentioned a few times in the past, I think nothing beats the texture of chicken that starts cooking low and slow. For weeknights this would be a bit tricky, this is the type of cooking I reserve for weekends. Phil loved this so much that he started getting nervous about the possibility of not enjoying it again for another 8 years. 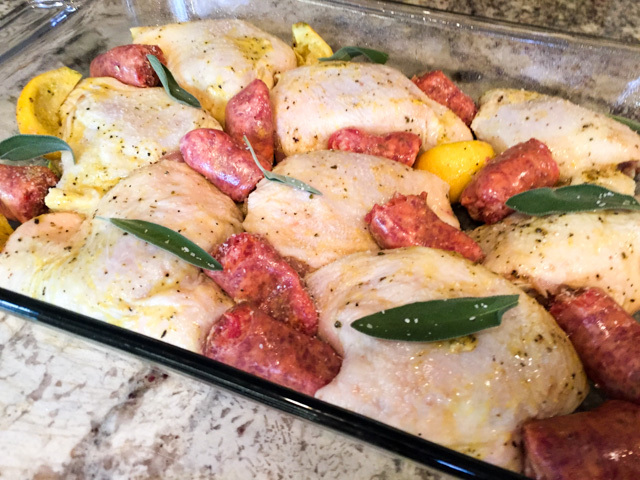 He kept dropping hints: ” I would not mind having this chicken every couple of weeks… Actually, you “could” make it weekly, you know?” So there you have it, it’s really a wonderful way to enjoy chicken, with the spicy tasty bits of sausage, and the flavors of sage and lemon. A keeper. 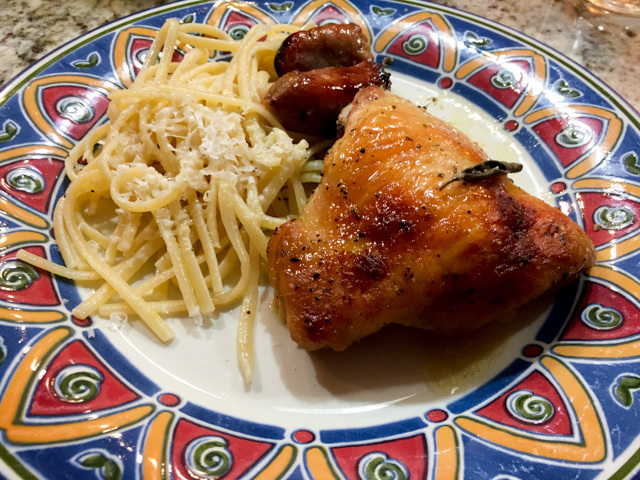 Another great recipe using my beloved pressure cooker, but no need to run away if you don’t own one, the original method (found here) uses a regular pan. We’ve been so busy lately (by lately I guess I mean a few years in a row…) that shortcuts to get dinner at the table faster are more than welcome. As long as they don’t compromise flavor. 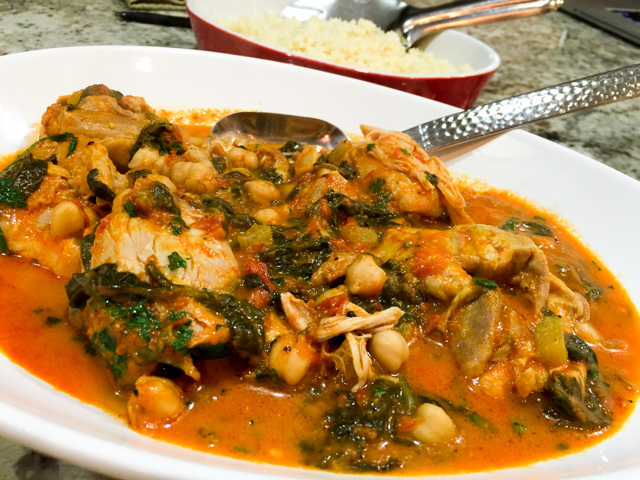 No need to worry about it in this recipe, flavorful is one adjective that comes to mind to describe it. Heat oil in a large heavy pot over medium-high heat or in your pressure cooker. Season chicken with salt. Working in batches, cook chicken, reducing heat as needed to prevent over-browning, until golden brown on all side.Transfer to a plate. Add butter and shallot to drippings in pot; season with salt. Cook, stirring often, until soft and fragrant. Stir in ginger, coriander, cumin, turmeric, and cayenne. Cook, stirring constantly, until spices are fragrant, about 1 minute. Stir in chickpeas and chicken broth. Return chicken and any accumulated juices to pot. Bring to a simmer. Cover pot and either braise it in a 325 F oven for about 50 minutes, or cook under pressure for 15 minutes. Quickly release the steam (or place the closed pan under running cold water in the sink), and when the pressure equalizes open the pan. Return the pan to the stove, add the spinach and simmer for a couple of minutes until wilted. Stir yogurt into cooking liquid, mix gently and serve right away, sprinkled with fresh cilantro, if you like. Strip any stems from all of the herbs, and chop them well – they should equal about a half cup total when they are all chopped. Whisk together the olive oil, vinegar, egg, salt and pepper. The egg is to keep the mixture emulsified, and though it is often left out of the original recipe, it works better with it. Whisk in the chopped herbs. 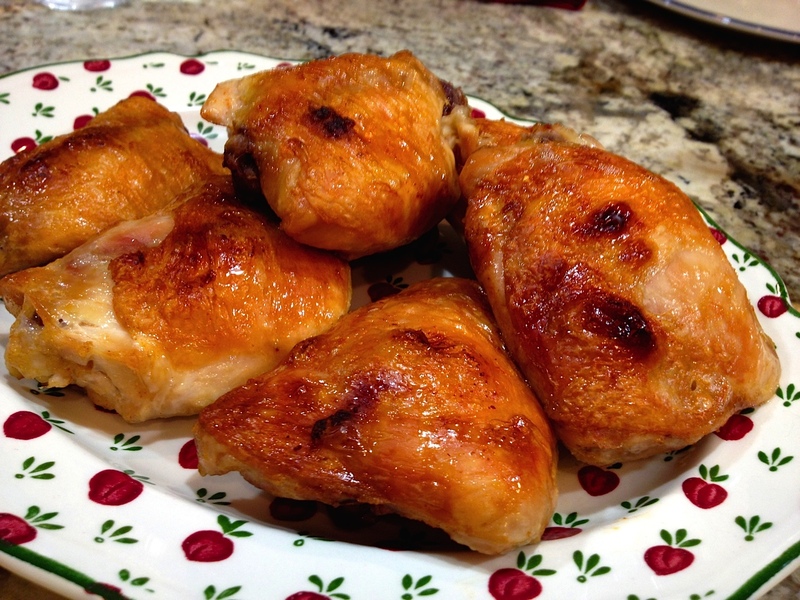 Trim the excess skin and fat from the chicken thighs, and pat dry with paper towels. Put the chicken in a large ziplock bag with the marinade. A couple of times a day, flip the bag over and move everything around a little to make sure all the thighs are getting marinated. After 24 – 48 hours, take the chicken out of the fridge. 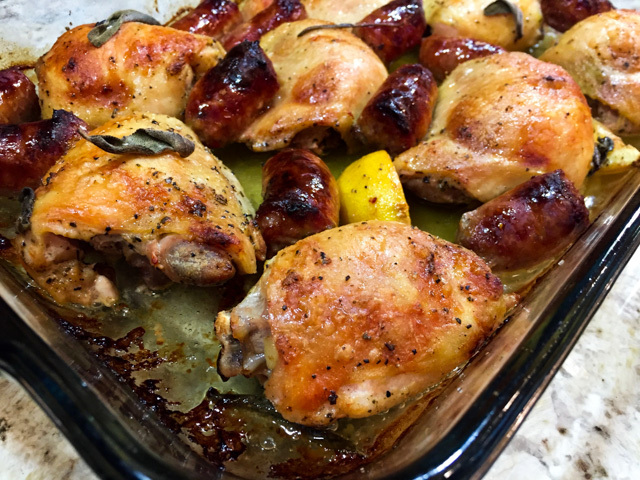 Arrange the thighs in a large saute pan or dutch oven – it is best if they can all lay flat, but if you don’t have a big enough pan for that, get it as close as you can. Pour over the marinade, and set the burner at medium. Watch carefully, and when it starts to boil, turn it down to barely simmering. After 10 minutes, turn each piece carefully, and cook another 10 minutes. Remove from the heat. Get your grill heated up, and be sure to oil the grates. 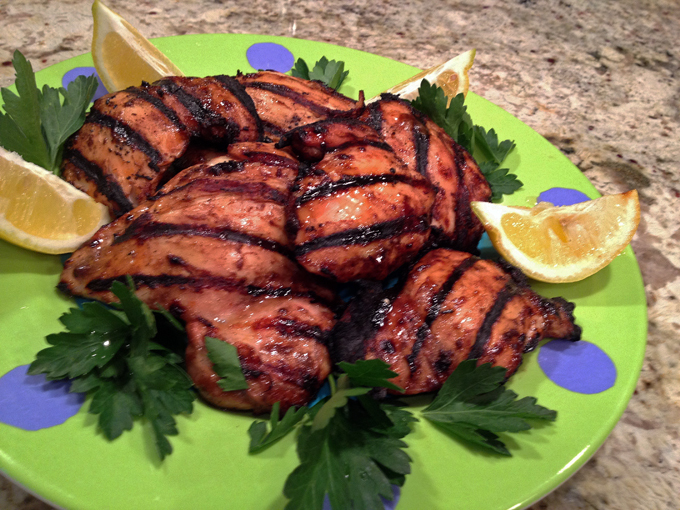 Once the grill is well heated, place the chicken, skin side down, on the grates. You may have some flare up because the oil is going to drip down some, but a spray bottle of water kept handy will take care of those. Don’t turn the chicken until you can pick it up off the gates without tearing the skin – when it is ready to turn, it will come up easily. This will take around 8 to 10 minutes, depending on your grill. Brush the marinade over the upper side a couple of times during cooking. Turn and grill the second side for another 5 to 8 minutes. If you like, check the internal temperature, which should be about 165 F. Let it rest around 5 minutes before serving. Grab a fork, and dig in! As I mentioned in the beginning of the post, I wanted to get a slightly more tender texture in the meat. So, the second time around I opted to sous-vide the meat in the marinade using water displacement instead of a vacuum-seal, and cooked it as described in this previous post. It all seemed to be going great, but disaster hit: I was careless while grilling the pieces skin side down, and…. 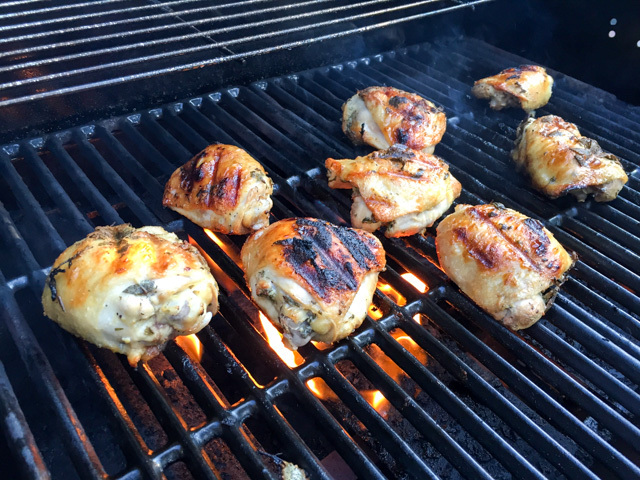 the thighs were charred to death. Black. Burned skin. 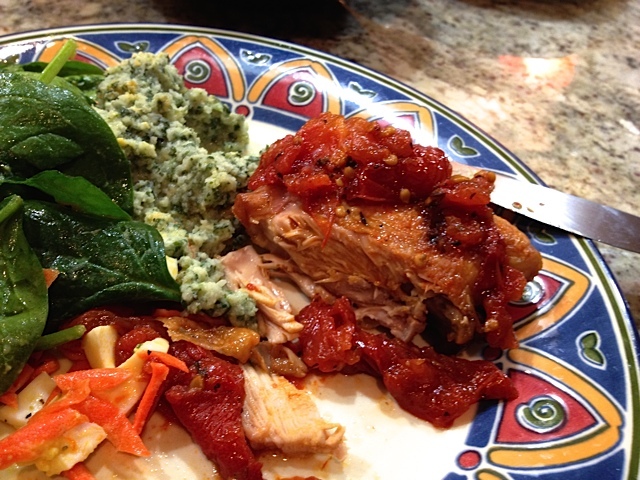 I was able to save some pieces for our dinner, but let’s say the looks were definitely not blog-worthy… Oh, well. Lesson learned. Here’s the plan: repeat this recipe one more time using my favorite method, which is low and slow, then blasting it on a hot oven, or as I intend to do it, on the hot grill. Watching over it as a hawk. 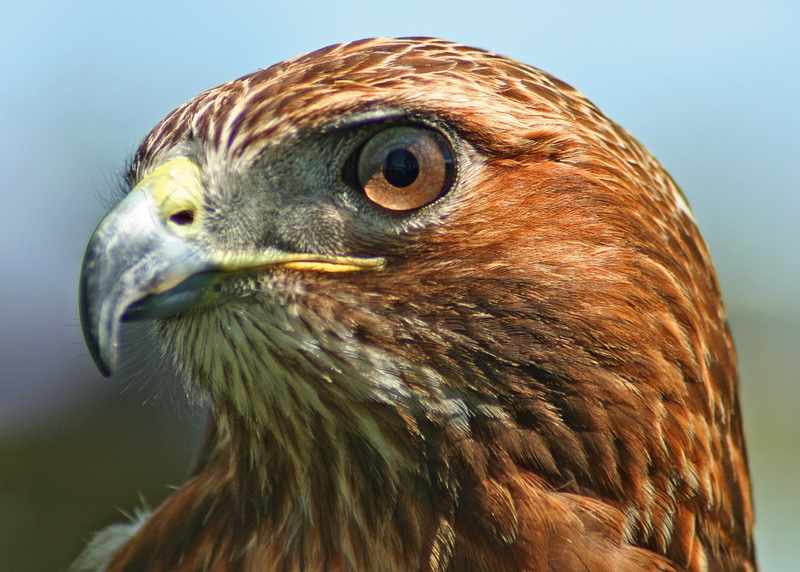 A hawk, I tell you! I am still having fun and getting more and more comfortable with my Anova sous-vide gadget. Many recipes tried, some will go un-blogged due to photos that did not turn out well. A lobster tail, for instance, was quite spectacular cooked sous-vide, but the pictures did the recipe no justice whatsoever. I shall re-visit that in the future to share the method in the Bewitching. But here I am today to show you two ways to deal with chicken thighs. 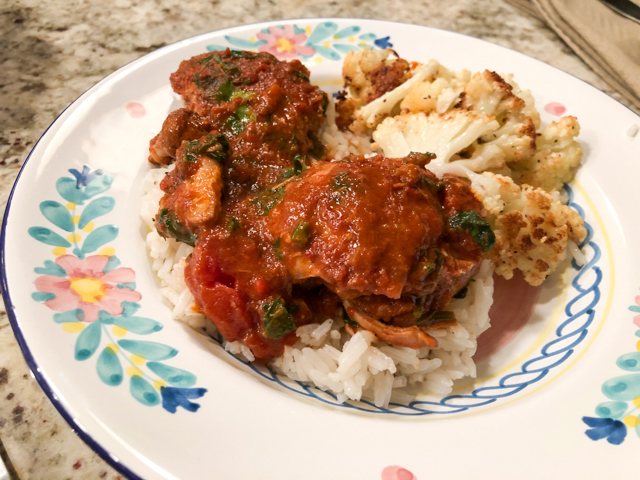 The first preparation uses boneless and skinless pieces, a departure from the classic Chicken Cacciatore that I found on this site, great source for sous-vide cooking tips and recipes. 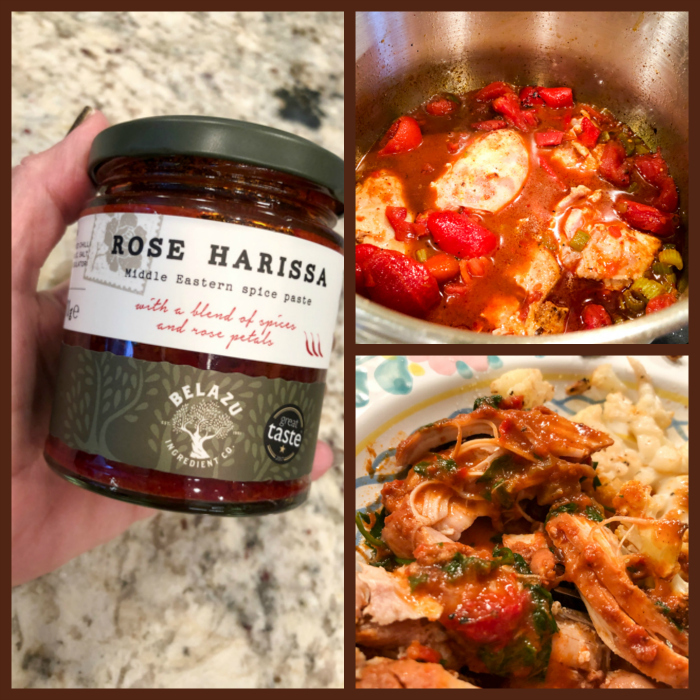 Before I share my recipes, I invite you to take a look at this recent post from my friend Maureen, at The Orgasmic Chef. Beautiful caramelized onions, without having to stand by the stove baby-sitting them. She got her sous-vide toy not too long ago, so I guess we are both newbies at this. Sous-vide sisters! Preheat the water bath to 152°F (67°C). Heat the olive oil in a sauté pan over medium heat and add the shallot and garlic. Cook until soft and translucent, about 8 to 10 minutes, being careful not to brown. Remove the pan from the heat and add the tomatoes, stirring to combine. Gently stir in the basil and the mascarpone. Season to taste with salt and pepper. Set aside to cool slightly. When the sauce has cooled, place about a third in a 1-gallon zip-lock bag. Add 3 of the chicken thighs. Add another third of the sauce, the other 3 thighs, and then the remaining sauce. Seal using the water displacement method. If serving immediately, transfer the chicken and sauce to a oven-proof dish or ramekin large enough to easily hold all the ingredients. Heat a broiler to high. Place the casserole under the broiler for a couple of minutes, watching closely, just to brown the sauce. And now, for a second method, in which the chicken thighs are cooked with skin and bone-in. As the sous-vide will cook the meat perfectly but leave you with mushy skin, all recipes include a final step to crisp the skin up. 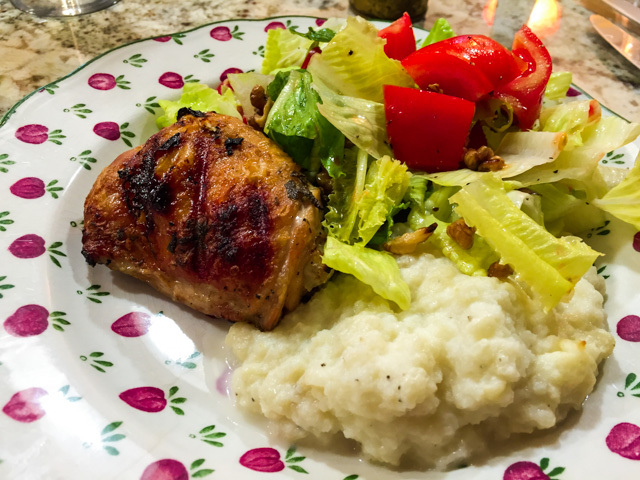 If you search the net, you’ll certainly stumble on a recipe by Michael Voltaggio that is described by many as “the best chicken thigh ever”. I tried it, I really did, and the mess it made on my stove left me on the verge of tears. Plus, the whole house smelled like fried chicken for weeks. Ok, for 18 hours. Chicken thighs were not going to meet the Anova gadget for as long as I was in charge of cooking. But, certain ordeals tend to be forgotten as time goes by. Since I really liked the texture of the meat, I decided to give it another try, using a very hot oven for the final step of crisping up the skin. Worked like a charm! The inspiration came from this cookbook by Jason Logsdon, which I own in its Kindle version, but I modified the recipe quite a bit, so I feel ok about sharing it with you. In his version, he crisps the skin on a cast iron pan, evidently, I didn’t. Prepare the roasted tomatoes in advance, they will keep for several days. Cut the tomatoes in half, mix them with the olive oil, season with salt and pepper, and roast in a 325 F oven for 2 hours. Transfer to a bowl and refrigerate. 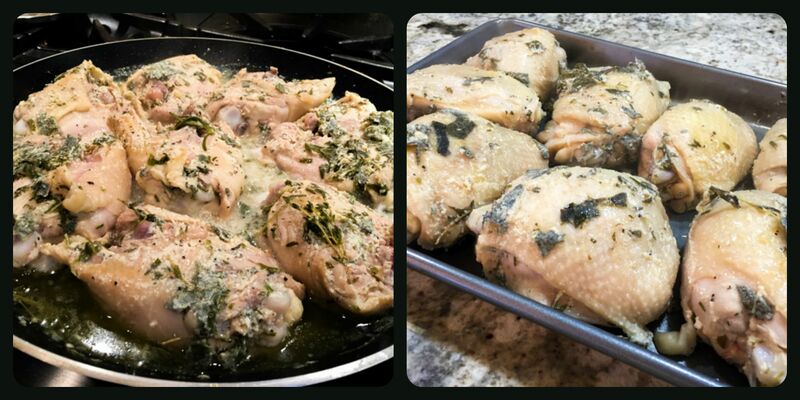 Set your Anova or other sous-vide apparatus at 148 F. Remove excess skin and fat from the chicken thighs. Season with salt and pepper, sprinkle chile powder, and squeeze a little lemon juice over the flesh. Place inside plastic bags and vacuum-seal, three pieces of chicken per bag. Place in the water-bath and cook for a minimum of 2 hours. I like to cook chicken thighs for 5 to 6 hours. Turn your oven to 450 F. Remove the chicken pieces from the bags, pat dry. 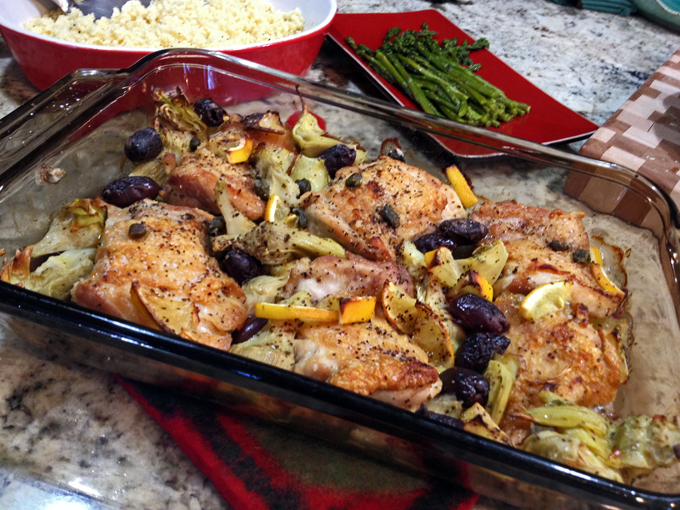 Place in a baking dish and roast until the skin is brown and crispy to your liking. You can also run them under the broiler for a few minutes if you prefer. 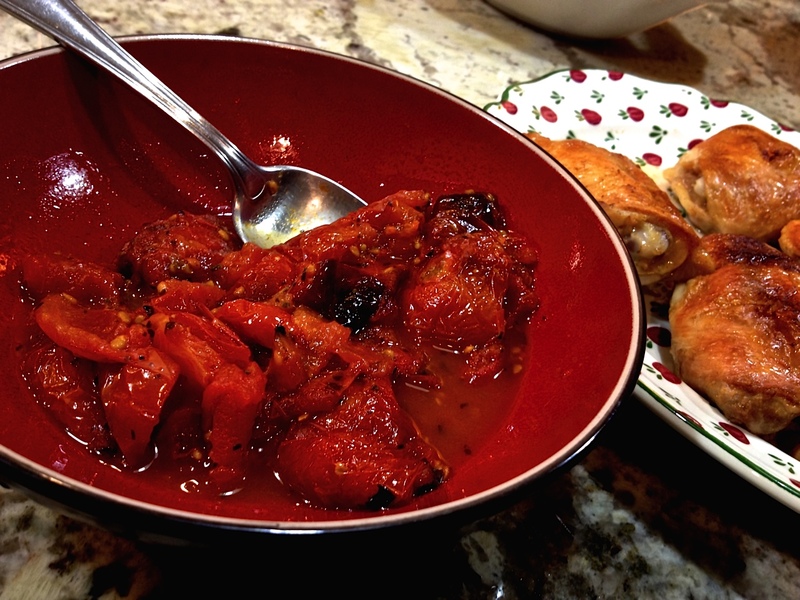 As the chicken roasts, transfer the previously prepared tomatoes to a skillet, cook for a couple of minutes, add the vinegar, brown sugar, and adjust the seasoning. Mash the tomatoes lightly with a potato masher or a fork if you like it chunky. 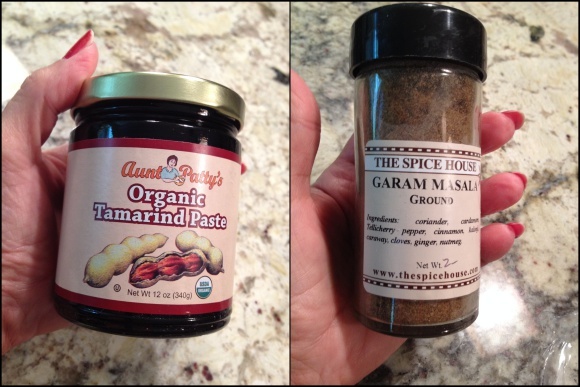 You can also transfer to a blender or food processor, if so inclined. I prefer my salsa to be on the chunky side. Serve the crisped up chicken pieces with the salsa alongside. Comments: So as I promised, here you have two completely different takes on the same type of meat using the Anova sous-vide. If you want to enjoy a saucy, stew-type meal, go for boneless chicken thighs, cooking them in liquid from the beginning. Obviously, in this case you’ll need to use the water displacement method, as vacuum won’t be feasible. If crispy skin is more what you are looking forward to, season the pieces with dry rubs, and use your oven in the end. The meat will be perfectly tender, very moist, and the skin super crispy. I highly recommend Jason Logsdon’s book “Sous-Vide Help for the Busy Cook”. The recipes are all geared for people who work all day and want to maximize the use of sous-vide to get a nice meal at dinner time. 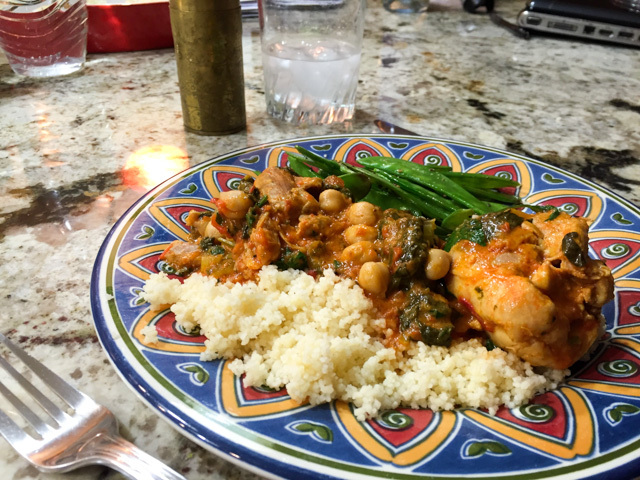 The main advantage of this cooking method is the flexibility of timing: if you are late to arrive home from work, no problem, two or three more hours at the target temperature will not affect your dish. 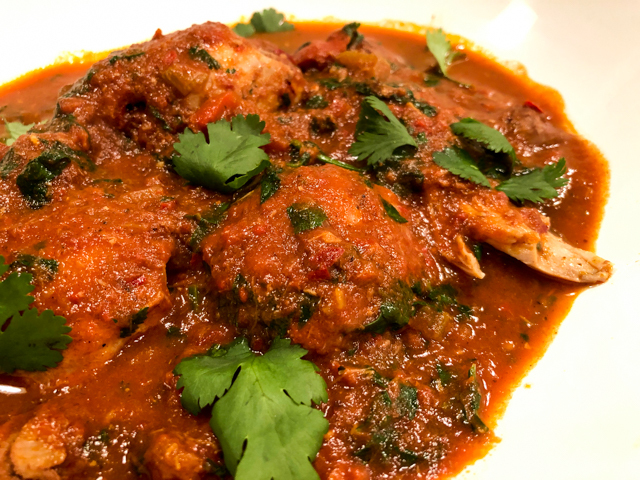 Seafood is a bit more delicate and you should probably save that for weekends or weeknights in which you have a couple of hours to devote to dinner preparation.